Tendering and procurement for this project was handled by an engineering contractor (EPC) working closely with the end client. The tendering process called for Hoist & Winch Ltd to assist the EPC in selecting the correct equipment in terms of dimensional criteria and also various operational characteristics required to satisfy the end client requirements. These very detailed discussions, which included the merits of air powered hoist units versus electric powered hoist units to be used in both Safe and Hazardous Areas, big bag handling applications, dimensional clearance requirements, control of hoist units by remote radio control, hoist unit mounted and remote wall mounted pendant controls. The outcome of the discussions resulted in a mixture of various types of both Safe & Hazardous Area application Stahl electric powered chain hoist units in the Swl range of 1t - 2t Swl being finally specified, which included low-head room big bag handling design type, remote radio control hoists, wall mounted pendant control hoists and conventional pendant control hoists. The end client also followed Hoist & Winch Ltd's recommendation to use the hoist manufacturer’s standard electrical equipment design package for various reasons including overall cost, manufacturing lead-time, standardization of spare part availability and fit for purpose. 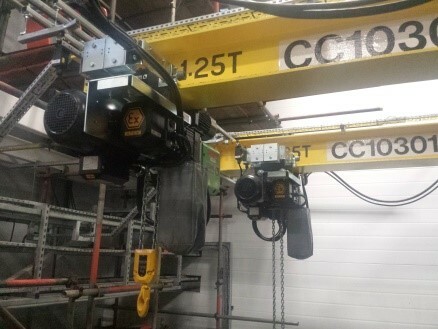 This was followed by a staged hoist installation programme over a 12 month period, which also included load testing of hoist runway beams installed by the steelwork contractor employed on the new build project. To facilitate hoist installation, Hoist & Winch Ltd also worked closely with the site scaffold contractor who was required to provide safe access for all aspects of the installation work. On completion, Hoist & Winch Ltd issued LOLER Thorough Examination Reports for the completed hoist and runway beam installation work. Hoist & Winch Ltd also carried out on site operator training for 2 – off Groups of 6 - off Hoist Unit Operators to cover the following topics: overview of hoist units supplied and main components, operating controls and features including hoist unit top & bottom limit switches & travel limit switches and E-stop, periodic checks and lubrication, annual inspection, service and certification requirements, safe loading & lifting of the big bags to be handled by the hoists, practical operation by each operator. All site installation work was again subject to very stringent planning requirements, which required very carefully documented Risk Assessments and Method Statements, which were reviewed and agreed by the site engineers and the Safety Department before any work could commence. This site work was also subject to CDM Regulations and site safety policy required all site engineers to hold a valid CCNSG Passport to Safety.